The Chinese e-commerce company that started in Jack Ma’s apartment in 1999 has evolved into a juggernaut that has since surpassed Wal-Mart Stores as the No. 1 retailer in the world. But can it replicate its success outside of its home country? Back in 2010 and 2011, Alibaba Group founder and executive chairman and thenchief executive Jack Ma and executive vice chairman Joseph Tsai were under pressure. Executives at Yahoo!, which owned a 40 percent stake in the Chinese e-commerce giant, were under the gun from their own investors to cut corporate debt and extract value from their prized asset, and they wanted to sell down their stake. The problem: The Alibaba executives were struggling to find buyers. After more than a year and a lot of scrambling, executives at the Hangzhou-based company finally were able to raise the $7.1 billion needed to buy back half of Yahoo!s shares. Alibaba executives had difficulty raising all the funds from only private investors, as many based abroad simply werent that familiar with the company. In the end the executives took out cash from the company's balance sheet. John Ho, the founder and chief investment officer of Hong Kongbased investment firm Janchor Partners, was one of the few true believers at the time. Without a moments hesitation he handed management $150 million to purchase bonds that were later converted into 8.3 million shares. Hos bold bet paid off brilliantly. Alibaba has transformed from a China- focused business founded in Jack Mas small apartment in once-sleepy Hangzhou into a juggernaut that has surpassed Wal-Mart Stores as the No. 1 retailer in the world. With gross merchandise volume of $547 billion last fiscal year, Alibaba now outguns Amazon and eBay combined, and its online sales and profits in 2015 topped those of all U.S. online retailers combined, according to digitalcommerce360.com, a Chicago-based research firm that tracks e-commerce worldwide. 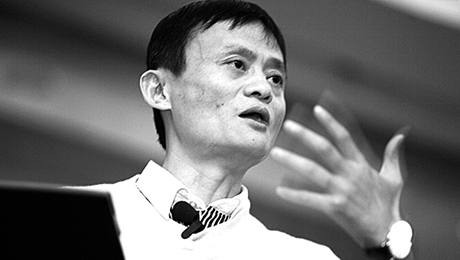 By its own estimates, if Alibaba were a country, its economy would be ranked the 22nd largest in the world. Among its boosters is Chinese President Xi Jinping, and top investors include Masayoshi Son, the chairman of Japans SoftBank Group Corp., which now owns a 28 percent stake in the company. Ho understands why Alibaba has such powerful allies. Propelled by the Chinese middle classs rising demand for consumer goods, Alibabas share price has rocketed to $149 since its public listing on the New York Stock Exchange in 2014  more than eight times the $18 a share Ho initially paid for it, and more than twice the $68 IPO price. Janchors asssets under management have grown dramatically as a result: Even after paying back some of its initial investors, the fund has grown sixfold, to $3 billion, of which the Alibaba shares make up a significant portion. His scrutiny is warranted, say some critical analysts and short-sellers. For all its success, Alibaba is facing challenges that could hurt its long-term prospects. Though group revenues continue to grow by double digits, its net profits fell for the first time in a decade in the 12 months ended March 31. Company executives point out that the decline was a result of a massive uptick in profits from a one-time disposal of certain assets in the previous year, which made the year-over-year comparison uneven. Alibaba also says more specifically that most financial analysts were focused on adjusted net income, which grew from $6.6 billion to $8.4 billion, and free cash flow, which increased from $8 billion to $10 billion during the same period. Some critics doubt the companys sincerity when it vows to stop the sale of counterfeit goods on its platforms. Furthermore, Alibabas revenue base is so China-centric that even some investors question whether the company has the ability to take on foreign rivals in offshore markets far from its home base. And Alibaba executives  even today  admit that global fund managers still have a difficult time understanding just what the company does. Maggie Wu, Alibabas chief financial officer, echoes Tsais concerns. Investors do not fully appreciate how our entire business is becoming more and more integrated and how that integration will drive tremendous growth and opportunity, she tells Institutional Investor. They are too focused on the Western models where the growth business is a separate entity. Driving Alibabas growth in the foreseeable future, Wu says, will be the ever-rising demand for online transactional services among the groups 454 million annual active buyers and 10 million online merchants. Alibabas powerful and well-connected supporters, and a throng of adoring analysts, think the company is in a prime position to thwart its rivals and succeed in its ambitious plans to aggressively expand its presence in other fast-growing emerging markets. In so doing, however, Alibaba will face off against not only critical analysts and skeptical short-sellers  but domestic rivals and local politicians in overseas markets, some of whom view Alibaba as nothing less than a threat to the real economy. Alibaba perfectly exemplifies those mythical tech start-ups that overcome seemingly insurmountable odds on their way to staggering success. A self-taught Internet guru, Jack Ma graduated from Hangzhou Teachers Institute in 1988 with a bachelors degree in English, but he couldnt get a job with a foreign company and was rejected by the likes of Yum! Brands, which was opening KFC restaurants in his hometown. Ma initially worked as a tour guide and then as an English teacher before teaching himself enough coding to figure out how to hire programmers and get them to implement his visions and business plans. He then cofounded a company called China Pages, which helped companies build websites. Ma finally caught a break in 1998, when the Ministry of Foreign Trade and Economic Cooperation appointed him to head up an information technology company that it was establishing in Beijing. Not wanting to be a technocrat, he quit and returned home to found Alibaba, which began in late 1999 as a business-to-business website that helped foreign importers source products from Chinese factories. In 1999, Tsai, a Taiwan-born, America-raised banker then with Swedish firm Investor AB, came knocking. The two hit it off so well that Tsai quit his job and moved his family to Hangzhou so he could join Ma. When I first met Jack, it was in his tiny second-floor apartment, says Tsai, recalling that the apartment, in the Hupan Garden complex, was smelly because Ma shared it with 17 other people who lived and worked there. Within a year of Tsais joining, Goldman, Sachs & Co. led Alibabas first round of fundraising by coinvesting with others, including Fidelity Growth Partners Asia, a total of $5 million, of which Goldman contributed about $3.3 million. This was soon followed by a $20 million second-round investment from Sons SoftBank Group. Alibabas biggest break came in 2005, when Jerry Yang, another Taiwan-born technology leader and then the CEO of Yahoo!, invested $1 billion and handed over all of Yahoo! Chinas operations in exchange for a 40 percent stake in the company. Yangs investment helped catapult Alibaba into the big leagues, says Duncan Clark, the author of Alibaba: The House that Jack Ma Built, published last year by HarperCollins/Ecco Press. The $1 billion infusion enabled Alibaba to accelerate the building of its consumer-to-consumer portal, Taobao.com, a marketplace for entrepreneur-retailers that was launched in 2003. Taobao was not profitable for the first several years, as Alibaba had to spend large sums to outpace eBay. But eBay, which once dominated Chinas consumer-to-consumer Internet market with a 70 percent market share, had to retreat in 2006 after seeing sales dwindle. According to research firm China- internetwatch.com, Alibabas Taobao and Tmall platforms now control close to 80 percent of Chinas online shopping markets in terms of gross merchandise value of goods sold, especially after factoring in transactions via mobile phone apps. Alibabas chief domestic rival, Beijing-based JD.com, comes in second, with a market share somewhere in the mid-teens, according to Shanghai research firm iResearch. Unlike Alibaba, which makes it the responsibility of merchants to ship goods to customers, JD.com follows Amazons model of using its own warehousing and shipping and requires that all merchants keep stock in JD.com logistics centers. In our view, Alibabas success to date has been due mostly to two factors  one, as an early mover, it met untapped consumption needs and now has 507 million monthly mobile active users, and two, its huge user base has made it a valuable partner for brands, notes Chi Tsang, the Hong Kongbased head of Internet research for the Pacific region at HSBC Global Research. Alibabas future success will be driven by its ability to use data to increase user engagement and online transactions, Tsang says. Not all analysts are so optimistic, however. Victoria Mio, a Hong Kongbased fund manager at Japanese-owned asset manager Robeco, says she thinks there could be a rise in bureaucratic crackdowns as Alibaba and other Chinese e-commerce companies expand into online finance without actually having domain expertise or risk management experience. We see increased risk to Alibaba affiliate ANT Financial as e-commerce companies expand into online finance territories, especially in areas where they actually take on balance-sheet exposure, she says. Mio adds that regulators are increasingly aware of the risks and are wary of an incursion by non-finance companies onto the turf of the nations large state-owned banks. Sources  including an adviser to the Chinese central bank  also say that Alibaba has at times come under attack from certain vested interests in Chinese political circles who fear Alibabas rise as Chinas shopping malls and department store operators are hit by shrinking sales. Those same sources, however, note that President Xi, who visited Alibabas offices and met with Ma when Xi was party chief of Zhejiang from 2002 to 2007, has played a hand in protecting the company from overzealous bureaucrats. Alibaba vice chairman Tsai insists that the company is not a threat to large retailers. He points out that the group is helping many of them transition to the online economy, adding that Tmall specifically caters to large department stores and consumer-brand companies. Tsai also argues that the companys expansion into online finance is not a threat to Chinas incumbent banks, which in the past focused primarily on funding large state-owned enterprises. We are providing a service to the Chinese economy by offering credit and finance to the little guy, people who otherwise would never get any financing from the major banks, Tsai says. He adds that in doing so, Alibaba has also created a national consumer credit rating system with 257 million activated users that provides participants with a credit score based on their activity within the Alibaba ecosystem. Tsai goes so far as to say that Alibaba is improving the life of the average Chinese citizen. He recounts a story of an 80-year-old woman who has a relative pay her electricity bill using the companys Alipay app, an online escrow payments service. Previously, the woman, who suffers from arthritis, used to have to stand in line at a bank for hours just to pay the bill. She doesnt need to do that anymore, Tsai says. That kind of evangelism was on display at Alibabas Investor Day summit, held June 8 and 9 at the companys sprawling, tree-lined Xixi campus in Hangzhou. Company chairman Ma proclaimed in front of the 450 major fund managers and analysts present that Alipay now boasts 632 million users globally, including 520 million in China and more than 100 million offshore when accounting for users of payment partners. Alipays sister service, online wealth and asset management platform Yue Bao, also showed tremendous growth: As of April, it had accumulated $165 billion in assets under management  after only three years in operation. Alibabas cloud service, in the first quarter alone, launched 152 new products and features, including cutting-edge big data solutions. As of March 31, the number of customers paying for cloud computing grew to 874,000, an increase of approximately 109,000 from the previous quarter, driving revenue growth of 103 percent year-on-year. For the fiscal year ended March 31, the companys revenues surged 56 percent, to $23 billion. Profits for the year slid more than 40 percent from a year earlier, to $6 billion. However, that was primarily because the previous fiscal years net earnings of more than $10 billion included a $7.2 billionwindfall from the disposal of certain assets, such as the sell-down of shares in Alibaba Pictures Group, a Hong Kong-listed subsidiary and Chinas leading movie production house. Gross merchandise volume on Alibabas platforms have already crossed the half-a-trillion- dollar mark, Ma reminded the audience at the Investor Day. 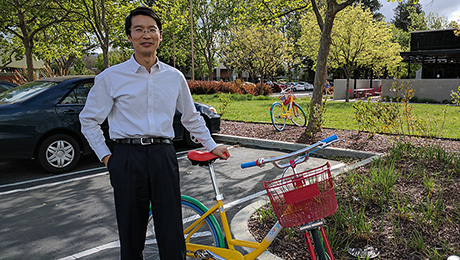 He predicted that sales will top $1 trillion by 2020, especially as the company builds offshore platforms that help all kinds of small businesses sell into China. Dont look at Alibaba as a company, Ma told investors, suggesting that they should think of its platforms as financial ecosystems or economies. Earlier this year, Ma told the audience, President Xi announced at the World Economic Forum in Davos that China will import $8 trillion worth of merchandise in the coming five years. What is $8 trillion? Sixteen Wal-Marts. This $8 trillion means a lot. It means a lot to China, it means a lot to the world, and it means a lot to a company like Alibaba. Ma went on to say that many of the imports will be handled via e-commerce and not through traditional retail channels, as many of Chinas 600 million smartphone owners have become accustomed to buying merchandise online. To speed up retail imports into China, bureaucrats in Beijing have cut the red tape of going through traditional import channels. They have approved the establishment of bonded warehouses in a number of free-trade zones that allow e-commerce and logistics companies to help exporters all over the world ship direct into China without having to pay customs duties. Maintaining this exponential growth will not be easy. To make sure Alibaba stays at the top of its game, the group recently made about $22 billion worth of acquisitions and and strategic investments, according to Tsai. He singles out Lazada Group, a Singapore-based firm that is backed by German venture capitalists. Alibaba paid $1 billion for Lazada last year, so far its single largest offshore acquisition, to gain immediate market penetration into Malaysia, the Philippines, Singapore, Indonesia, Vietnam, and Thailand. At the end of June, Alibaba announced it will invest another $1 billion to strengthen Lazadas Asian market presence. Alibaba has also invested $1 billion to build a global smart logistics network known as Cainiao, Tsai says, adding that the company has distribution networks in more than 220 markets and is building the capability to deliver any merchandise anywhere in the world within three days of a purchase. Furthermore, Tsai notes, AliExpress.com, the groups international business-to-consumer platform, is making inroads into emerging markets outside of Asia, chief among them Russia, where it has become the top e-commerce platform. Lazada and AliExpress will all move very fast, Ma said at the investors summit, noting that the number of Chinese middle-class consumers may grow by 70 percent, to 500 million, by 2020 and that their demand for imported goods will rise dramatically. Alibabas ultimate goal, Ma explained, is to make globalization more inclusive, to help small and medium-size enterprise owners all over the world sell into China and other fast-growing emerging markets. To that end, Ma hosted 3,000 such enterprise owners on June 20 and 21 at an Alibaba trade show in Detroit aimed at boosting American imports in China. Called Gateway 17, the summit was part of Mas efforts to keep an earlier promise to President Donald Trump. Ma met with Trump on January 10 and vowed to help American enterprises create a million jobs in the coming decade by simply selling to Chinese consumers. Ma told the 3,000-plus delegates at Cobo Center in Detroit that China badly needs goods and services from outside the country. The Detroit show aside, Alibabas strategy is not to focus on developed markets by directly taking on the likes of Amazon, say company executives, but rather to focus on emerging markets  where there are few mature e- commerce rivals. Alibabas goal is to reach 2 billion consumers, a number so large that some analysts arent sure it can ever be achieved. Cyrus Mewawalla, the head of London-based boutique CM Research, says that Alibaba will certainly face multiple unforeseen challenges in many foreign markets, where it lacks the political connections it has in China. One must remember that Chinas tech sector is highly protected, so Alibaba may have a harder time overseas than it has had domestically, says Mewawalla, noting that many foreign Internet companies, such as Google, Twitter, and Facebook, are largely banned in China and that Alibaba may face similar political obstacles abroad. Whats more, Alibaba isnt the only company trying to broaden its horizons. Its rival JD.com is also aggressively expanding in Southeast Asia. Still, some say Alibaba doesnt need to reach the 2-billion-consumers target to be successful. Paul Schulte, an independent analyst based in Hong Kong, said the company is on strong footing even if it is not able to grow its footprint beyond China. Alibaba can grow its offshore revenues simply by catering to Chinese tourists who go overseas, says Schulte, the chief executive of Schulte Research International, who notes that there were 120 million Chinese tourists traveling outside the country last year. The outbound traffic is predicted to rise to 200 million by 2020, he says, adding that many Chinese tourists use Alipay when overseas. A core part of Alibabas strategy has been to build databases around the transactions of the 450 million active buyers who use its Alipay platforms. Schulte notes that the company is working hand in hand with the government, and much of the nations banking industry, through its AliCloud service, which has become Chinas biggest online database of financial transactions. AliCloud service already has become the repository for much of the banking data in the country, Schulte notes. For his part, Alibabas Tsai thinks the biggest challenge facing the group  which has 60,000 employees, up from 18 when he first joined Ma  will be keeping its innovative spirit.